Mineral fiber systems. These systems may be installed over many substrates including steel studs, wood studs, CMU, clay, and concrete. Live loads imposed upon the system (primarily wind pressures) paired with the substrate type will dictate the size of anchors and spacing required to achieve proper pull-out strength. Some manufacturers use small, triangular, intermittent wall brackets that allow direct attachment of vertical or horizontal rails. Having this flexibility built into the attachment configuration frees designers to layout façade panels any way they'd like, especially if secondary rails are added to the attachment assembly. The small steel brackets are anti-corrosive coated and include a durable plastic base and integral plastic washer. With such a system, only a ribbed area of the plastic base touches the wall substrate, significantly reducing thermal bridging at that point of contact, a particular area of the building envelope that can potentially contribute to heat loss and gain. A plastic cap isolates the stem of the wall bracket from the rail to further decrease any thermal transfer from the bracket to the rail. There is no metal-on-metal contact, which is the key to the brackets' effectiveness. These assemblies have also been seen to incorporate built-in methods of plumbing the façade during installation. One way to accomplish this is by allowing the rails' connection with the bracket to be variable so the installer can adjust on the fly. The second option involves adding specially designed shims between the thermal isolator and sheathing. 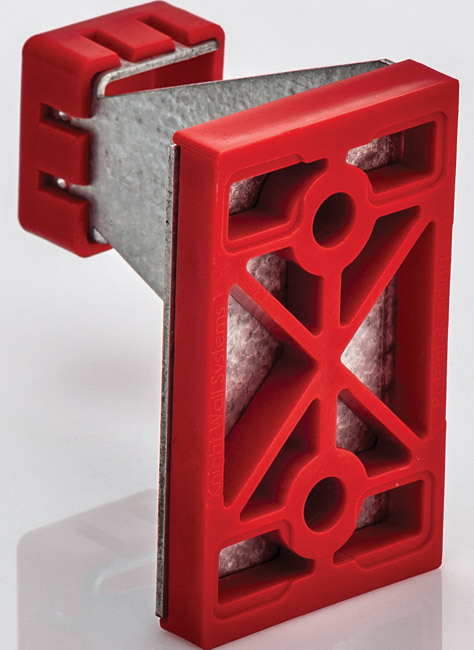 Isolator shims are provided to fit square, straight, and flat to the back of the system via raised lips that lock the shim in-place for a structurally secure and sound connection without affecting thermal transmittance negatively. Typically, manufactures create air cavities anywhere from 0.75 inch to 1.5 inches depending upon rail configuration and panel requirements. 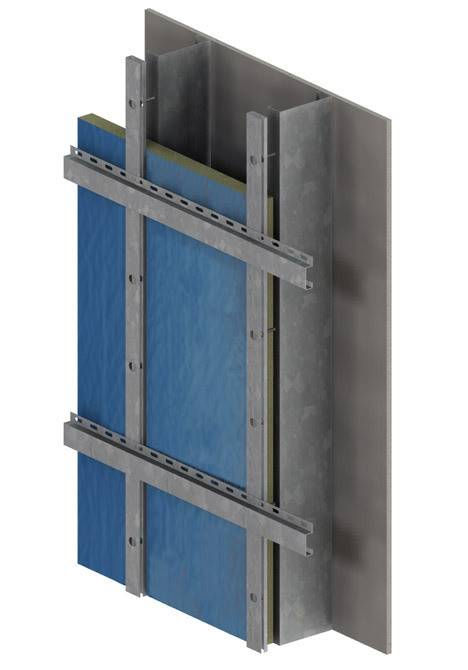 Such rainscreen attachment systems can be used with mineral fiber while providing close to the same energy-efficiency of a true continuous insulation rainscreens. A bracket typically used with mineral fiber insulation. Note the webbed thermal isolation base which not only reduces thermal transfer due to lower conductivity, but also reduces contact area with the substrate by approximately 60%. Rigid foam system. Approaches for rainscreen attachment with rigid foam consist of continuous vertical girts which rest outboard of the insulation, and optional horizontal tracks, to mount a variety of cladding types. The vertical girts resting on top of the 25 psi compressive strength rigid insulation are secured by thermally isolated fasteners penetrating through the continuous exterior insulation and into the substrate. Not only does this system approach comply with code requirements for ci, but thermal modeling shows that the thermal isolators on each fastener will reduce “fin effects” which can reduce wall assemblies by as much as R-1. As with mineral fiber bracket systems, live loads imposed upon the system (primarily wind pressures) and substrate type will dictate the size of anchors and spacing required to achieve proper pull-out strength for long lasting performance. Continuous insulated rainscreen systems give designers and owners the ability to create the thinnest profile, code-compliant, exterior-insulated wall assemblies possible. Rigid foam system with a properly designed high-bending strength girt and no thermal bridges other than fasteners. Rigorous models have compared these two system approaches to conventional methods. Since heat transfers through an assembly in three dimensions: outward (or inward) through the wall, up the wall and laterally across the wall all at the same time, the best and most accurate way to calculate the overall thermal resistance of a wall assembly is by use of 3D thermal modeling software. For the 3D thermal analysis, many manufactures have used the expert services provided by third-party testing. This testing utilizes the same 3D heat transfer software and algorithms used to model the heat flow on the space shuttle's ceramic/composite tiles when re-entering Earth's atmosphere. However, with any computer modeling “junk-in equals junk-out,” and therefore calibration of the software must be completed for proper data results. This software has been calibrated within 5 percent of dozens of real world building ASTM “hotbox” tests and is considered to be one of the world's most accurate 3D building heat flow models to date. In both cases, because the backup wall plays a small role in thermal bridging, the onus is on the cladding attachment system to play the most important role in the thermal resistance of the assembly.